The October 2008 'Books all seem to be suffering from the Rev. A Blues - problems with the keyboard and third-party RAM on the MacBook, the Nvidia graphics system in the MacBook Pro, and subtle lines in the display of the MacBook Air - we have separate headings for each of these in this week's 'Book Review. Apple is addressing these teething problems as quickly as it can and has released SMC and EFI firmware updates for each of the new October 2008 MacBook models, which should fix some of these issues. Does the MacBook Merits an Eddy Award? Are Apple's New MacBooks 'Cranky'? MacBook Pro: Production Issues or Bad Luck Samples? "The long-predicted crossover has arrived. More laptop computers will be sold this year than desktop computers. But it's actually a double-crossover year. Handhelds and other ultra-small devices, in the form of smartphones and Net books, are fast emerging as the mobile computers of choice among consumers...."
If you're planning to invest in a laptop this Christmas, Reevoo.com have put together a list of the highest rated and the most popular in 2008 to help you decide what to buy. While some of the highest rated laptops of 2008 are Apple products, interestingly some of the most popular laptops are the less expensive options such as the Advent 4211 and Acer Aspire ONE A110A, further testament to the current economic climate. + This little PC is an absolutely top notch system. + It's just fantastic. The best money I ever spent. You can use it anywhere. I wouldn't be without it. - No CD/DVD drive is the only downfall but not really a problem as I bought an external CD/DVD drive and the problem is solved. As with all gadgets, there are the ones people rave about and the ones that actually end up under the tree. Reevoo brings you the best of both worlds, offering you the most popular laptops verses the highest rated. For more details, see Reevoo's blog, Decide What to Buy. If money is tight and getting a bargain is top priority, consumers should hunt out the 13 inch Toshiba U400-145 which has seen the biggest price drop. It packs in a 160 GB hard drive, WiFi, 2 GB RAM and a DVD writer. Check out www.reevoo.com for thousands of genuine reviews and scores for laptops. "It's hard to hide from the downbeat headlines these days - which pretty much sums up what we've been finding in the PC sector. "But there are small glimmers of hope. ChangeWave's latest survey on consumer PC buying shows weaker demand for the holidays - yet there are also positive signs for Apple, and most surprisingly, for Dell. "Midst the bad news, Apple and its newly revamped MacBook line are still managing to gain traction with consumers. "The new Apple MacBooks feature aluminum unibody enclosures and improved graphics, as well as glass multi-touch trackpads - and 7% of respondents now say they're likely to buy one over the holidays. "In addition, another 6% say they're likely to purchase the traditional White MacBook Laptop, which Apple recently lowered the price on to $999. "Overall, one-in-three respondents (33%) plan to buy an Apple laptop over the next 90 days - up 4-pts since September - while 27% plan to buy an Apple desktop, a 1-pt increase...."
"Good news for Apple: People love their Macs, and more people want to buy them instead of Windows PCs. Potentially bad news for Apple: Two-thirds fewer people are planning to buy computers this holiday season, according to survey results published today by Morgan Stanley. More people are 'seriously considering' buying a Mac for their next PC purchase - 17% - than before - 14% two years ago. But just 3% of respondents plan to buy a PC during the holiday season, down from 9% last year and 6% in 2005. And just 24% plan to buy a PC during the next two years, down from 55% in 2005. "What's that mean for Apple?" "Have we entered the era of the netbook?.... In recent months the form factor has become so popular sales figures are rivaling Apple's iPhone, according to sales data. "According to the latest smart phone sales numbers from Gartner and DisplaySearch's netbook sales numbers, 4.7 million iPhones were shipped in Q3 2008 while a whopping 5.6 million netbooks were sold in the same period." "Faced with the perfect storm of a bleak market and a boom in ultra-budget portables, Apple is believed by some to be readying its own take on the netbook for the first half of 2009. "...while the Mac maker's chief Steve Jobs has argued that the iPhone is netbook-like in fulfilling many of the same online roles, the researcher believes that the desire for a keyboard ultimately the usefulness of the iPhone for certain software and that something more is necessary." "As we watch the US Auto industry struggle with the very real likelihood that it won't exist by the end of next year, because those did not build the cars people wanted to buy, it is only conclusive to ask whether the US technology is going down a similar path. The US Auto industry was blindsided as they ignored the trend towards more efficient cars, bled share to companies such as Toyota and was virtually killed when the economy collapsed. So, how is the situation with tech? "Right now, the PC market wants a MacBook Air-like product in the sub-$800 price range. TG daily just ran a piece on such a product and its opportunity. But, by all measures, the PC vendor that could provide such a product would likely be unable to keep up with demand. Yet, even though it is possible to build such a product, there isn't a single one in the market. Why? "Intel and Microsoft won't let them build one. Let's look at this a bit closer...."
"Let's cap off a week that saw us announce this year's Eddy Award winners by revisiting one of the more contentious debates among our editors: whether to give an award to Apple's redesigned MacBooks. "We lauded many of the changes introduced to the MacBook line this fall from the new case to the improved graphics. But do those changes merit an Eddy Award? "Making the case that we erred by leaving the MacBook off our list of winning products is senior news editor Jonathan Seff; assistant editor Chris Holt makes the case against the MacBook as an Eddy winner." "There is. Launch System Profiler (found in the Utilities folder or by choosing About This Mac from the Apple menu and then clicking the More Info button), select Power in the Contents pane, and Battery Information will be the first entry. If you're running Leopard, under the Health Information heading you'll see Cycle Count and Condition entries. If you're running Tiger, you won't see a Condition entry." "MacNN was first to break the news earlier this week concerning a newly proposed notebook cooling system patent form Apple and today; the US Patent & Trademark Office has revealed that Apple is also contemplating a secondary approach to cooling systems for notebooks. The secondary approach involves the use of a hybrid diamond heat spreader. With news this week that MacBooks are having trouble with heat issues once again, the timing of these dual patent revelations couldn't be more appropriate. According to the documentation, Apple has been hard at work on this issue since early 2007." "Thanks to shipments of Apple's new notebook PCs and Acer's new Netbook PC, Quanta Computer Inc., world's largest contract supplier of notebook PCs, is expected to achieve a growth of 5-10% in its shipments for fourth quarter of this year, according to company sources. "...According to institutional investors, overall PC shipments are estimated to decline 5 worldwide next year, with notebook PC to grow 10% and desktop PC to recede 19%. "Regardless of the deterioration and a host of doubts from institutional investors, Quanta is keeping its original projection at a 5-10% growth in its notebook PC shipments for the fourth quarter of the year, due mainly to its shipments to Apple and Acer to drive sales." "The keys on all MacBook laptops are held in place by a rocker mechanism that connects to the keycap via a hinge and snap. If a key is loose, it is recommended to lift it up to see if the snapping clamps are blocked or broken. If so then a replacement can be installed at any authorized Apple service center, or users can try installing new ones themselves. Some keycaps can be purchased at various online sources as well, including PowerBook Medic." "Macs are notorious for being intolerant when it comes to memory upgrades. They have been known for years to start exhibiting problems when RAM goes bad and especially when third party RAM upgrades are installed. Savvy Mac owners know there are a few vendors that produce RAM modules that work fine in Macs and know that to use RAM modules from other sources is asking for trouble. "I was aware of this reputation so when I decided to upgrade my new aluminum MacBook to 4 GB I played it safe and bought the memory from Crucial. Crucial memory has long been acceptable to use in Macs and I expected no problems from the upgrade. That was overly optimistic as it turned out...."
"Reports abound that the latest MacBook might be shipping complete with some grim new flaws to go with that gorgeous new facelift. "It seems that the memory controller being used in the motherboards is incredibly finicky about the particular type of DDR3 RAM that's bunged in. Users all across the Apple imperium (should we just say orchard?) are reporting that RAM upgrades from companies such as Crucial and Corsair are causing system instability, lock-ups and crashes after installation." "Some users of new MacBook and MacBook Pro laptops are reporting that their machines become unstable or lock up after they add third-party memory, according to messages posted on Apple Inc.'s support forum. "Although OWC was the most frequently cited supplier, some users also noted that they were having trouble with memory bought from Kingston Technology Corp. and Crucial.com, the online arm of chip maker Micron Technology Inc."
"Cranky, as in 'screwy' video cards, 'insomniac-like power-sucking' sleep mode and not playing well with third-party RAM, according to Gizmodo's Matt Buchanan. "The video cards? When asked about the issue, AppleCare UK stated that company reps are 'aware of the issue and are investigating. At present we do not know if this is a hardware or software issue and have been advised not to offer customers exchanges until the issue is better understood.'" Link: Are Apple's New MacBooks 'Cranky'? Bad bumps? A UK tech site is alleging that the latest Apple MacBook Pros contain Nvidia graphics chips with the same 'bad bumps' problem that Nvidia addressed this summer and said was rectified. "We would most likely not talk about this problem if it was the only cases reported, however we received similar information from different MBP unibody owners...."
Link: MacBook Pro: Production Issues or Bad Luck Samples? "Owners of some MacBook Airs have been reporting ongoing trouble with their displays, accounts say. The problems began to manifest in early November, and are said to consist of subtle gray or white lines spread across a screen, either horizontally or at a slight angle; the effect is said to give an Air screen the resemblance of paper. The lines also appear on first boot, eliminating the possibility of some later corruption. "No official response to the issue has so far been published, but Air owners do report that Apple engineers - along with staff from AppleCare and Genius Bars - are aware of the flaw, and that the issue is being investigated...."
"Mac-centric web forums are abuzz with complaints about MacBook Air display problems. It would seem they're getting laid. "In paper-making parlance, 'laid' refers to paper with thin, tightly spaced horizontal lines. Some unlucky Apple MacBook Air owners claim that noticeable horizontal - or nearly horizontal - grey lines are turning up on the displays of their precious-but-pricey lightweight laptops. "According to posts on the Apple Discussions forum, MacRumors, and eWeek's Apple Watch - and well-illustrated in a click-to-enlarge screenshot on TidBITS - the offending lines may be subtle but they're inarguably annoying." "The launch of Apple's new unibody aluminum Macs hasn't been the smoothest ride, for both the company and its loyal customers. There was disappointment over what didn't (FireWire) and what did (HDCP) make it into the new machines. The innovative new trackpad design nearly underwhelmed thanks to a glitch that resulted in it failing to recognize clicks every so often. Finally, two graphics-related issues began cropping up in MacBooks and MacBook Pros, problems which Apple is currently investigating. "Apparently, the MacBook Air was tired of its bulkier cousins getting all the negative attention. Recent reports from users indicated Apple's ultra-portable is also experiencing problems associated with graphics output...."
"Apple's October 2008 laptop refresh introduced some major changes. New unibody designs provide an easy-to-spot visual differentiation, while new dual graphics chips distinguished the new 15-inch MacBook Pros from the new aluminum MacBooks. The 17-inch MacBook Pro 2.5 GHz saw changes as well, but the changes were much more subtle. These tweaks, modest as they may be, make the 17-inch MacBook Pro quite an attractive option for anyone looking for a true desktop replacement system. "Macworld likes the latest 17-incher's speedy performance; the high-resolution screen with both glossy and matte surfaces available, but doesn't care for the big 'Book's weight and lack of some of Apple's latest laptop technology." "Unfortunately, its feature set is the one place where the new MacBook Pro couldn't deliver. Built-in media card readers are found in almost every laptop on the market - except those with the Apple logo. With the proliferation of digital cameras, you'd think that Apple would at least include an SD slot. The MacBook Pro, however, did manage to carry forward the ExpressCard slot, for expansion devices like mobile broadband. "Design alone is probably enough to have Mac fanatics reaching into their deep pockets once again, but if you're looking for a longer list of features, the HP HDX16t has higher screen resolutions, Blu-ray drives, HDMI-Out, an E-SATA port, and more USB ports - and its cheaper, too." The updater application will be installed in the /Applications/Utilities folder and will launch automatically. Please follow the instructions in the updater application to complete the update process. This update fixes several issues to improve the stability of MacBook (Late 2008) computers. This SMC Firmware Update improves the sensing and accuracy of the MagSafe Power Adapter indicator light, and the battery charge indicator lights on MacBook Pro (Late 2008) computers. This update fixes several issues to improve the stability of MacBook Pro (Late 2008) computers. This update fixes several issues to improve the stability of MacBook Air (Late 2008) computers. PR: Other World Computing has announced two new OWC "Mercury" SuperDrive Internal Upgrade Kits for MacBook Pro 17" notebook computers. 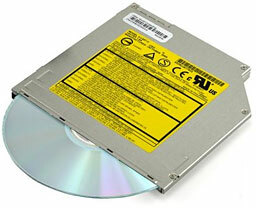 The new OWC Mercury SuperDrive Internal Upgrade Kits provide low-cost options for adding the latest optical drive performance and features to MacBook Pro 17" notebook computers, with faster read/write for DVD+/-R/RW, Dual-Layer DVD, DVD-RAM, and CD-R/RW; and burn speeds of up to 8x for DVDs and 24x for CDs. OWC Mercury MacBook Pro 17" SuperDrive Dual-Layer Internal Drive Kit. Features burn speeds of up to 8x for DVD-R, 6x for DVD-DL, 5x for DVD-RAM, and 24x for CD and a 1 year OWC warranty. Priced at $89.99. OWC Mercury MacBook Pro 17" SuperDrive Dual-Layer Internal Drive Kit (with media and software). Features burn speeds of up to 8x for DVD-R, 6x for DVD-DL, 5x for DVD-RAM, and 24x for CD. Includes 10 pieces of 8x DVD-R media in a jewel case, EMC Retrospect backup software, NTI DragonBurn CD/DVD authoring software, and a 1 year OWC warranty. Priced at $104.99. OWC also has internal and external SuperDrive upgrades for nearly every desktop/tower and notebook Mac computer introduced over the last decade, including Mac Pro, MacBook 13", MacBook Pro 15", PowerMac G3/G4/G5, G4 Cube, iMac G4/G5, Mac mini, eMac, PowerBook G4 Titanium 15", PowerBook G4 12/15/17" Aluminum, and iBook G4. If you'd like to upgrade from a factory-installed DVD read-only drive; replace a slower or inoperative SuperDrive; or expand drive capabilities, OWC has the best solutions, with prices starting at $27.99 for Internal SuperDrives and from $71.99 for External FireWire+USB 2.0 SuperDrives. OWC SuperDrive upgrades feature faster read/write DVD, Dual-Layer DVD, and CD burn speeds up to 20x for DVDs and 48X for CDs. In addition to standard support for DVD+/-R/RW, CD-R/RW, DVD-DL formats, OWC SuperDrives are also available with features for Blu-ray, LightScribe laser labeling, and DVD-RAM support. OWC offers rebates of up to $25 to users who send in any older working optical drive to upgrade to a new, faster SuperDrive purchased from OWC. PR: You can use your laptop anywhere in your home. But what you gain in mobility, you often sacrifice in comfort. To address this pain point, Logitech today introduced the Logitech Comfort Lapdesk for Notebooks - the newest addition to the company's line of notebook accessories. The Comfort Lapdesk provides a stable base and helps protect against laptop heat whether you're working from the comfort of your couch, relaxing on your bed or reclining on the living-room floor. "While other lapdesks promise improved comfort, they often fall short because of poor design and low-quality materials," said Denis Pavillard, Logitech's vice president of product marketing for keyboards and desktops. "The new Logitech lapdesk has a thoughtful design that will help make your laptop experience more comfortable, wherever you use your computer." Logitech research revealed that nearly 60 percent of people who use a laptop at home use it on the couch so they can be with their families while browsing the Web, e-mailing or chatting. In addition, the research showed that 36 percent use a laptop on the bed and 16 percent use it while sitting or lying on the floor. However, nearly 50 percent of those people report concerns about laptop heat and 41 percent raise concerns about posture. Some people use a pillow or book in an attempt to provide a barrier to the heat emitted from the laptop, but those solutions often end up trapping heat, making it even hotter. Unlike makeshift solutions and other lapdesks, the Comfort Lapdesk features a four-layer, heat-shielding design. The bottom-layer's fabric and an airflow chamber between the lapdesk's base and top combine to further minimize heat. Plus, instead of the whole laptop lying flat against the body, the arched base makes contact with the legs in just four places, improving air flow. To provide a stable foundation for comfortable laptop use, the cushioned base allows people to relax their legs instead of locking the knees together to support the computer. In addition, a non-slip glossy finish on the top of the lapdesk helps prevent the computer from sliding around. And a 12-degree angled riser positions the notebook to a height that supports neck and leg comfort (when used in a seated position). 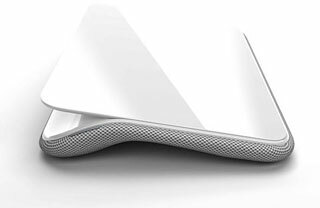 When you're done using the computer, the lapdesk's thin, streamlined profile makes it easy to slide under a couch or bed, or it can stand upright for storage next to the sofa. The Logitech Comfort Lapdesk for Notebooks is expected to be available in Europe in January and in the US in February for a suggested retail price of $39.99. 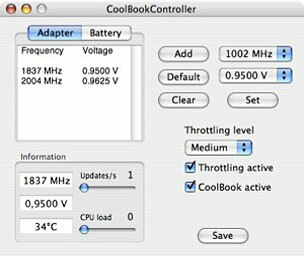 PR: CoolBook is a tool for the MacBook and MacBook Pro computers. It lets you monitor the frequency, voltage, and temperature of the Core Duo/Core 2 Duo CPU. Use your MacBook with full performance without a battery installed. Storing your battery properly when not used will reduce battery aging. In two different tests using the maximum frequency of a MacBook (1833 MHz), meaning no performance loss. In both tests different voltages between 0.9875 V and 1.2625 V were tested. In the first test, several processor demanding tasks were repeated. The fan was locked at the max setting (6200 RPM) using the app smcFanControl. CPU temperature decreases as voltage decreases. CoolBook was then used to set the maximum frequency, and to change the voltage. When the temperature had stabilized, it was recorded. This procedure was repeated for every voltage in the diagram. The maximum temperature using 0.9875 V was 58°C, compared to 73°C using the original settings. But even the modest voltage decrease to 1.1000 V showed a substantial temperature decrease, with temperatures close to 60°C. Maximum fan speed decreases due to less heat generated by running the CPU at reduced voltage. As the MacBook gets warmer, the fan will automatically increase the rotation speed. This diagram shows the differences in RPM at the end of the Cinebench benchmark. The original driver ran more than 2000 RPM over the lowest CoolBook setting. Not showing in the diagram is the differences in temperature. At 0.9875 V the temperature reached a maximum of 63°C, while the original driver reaches 72°C. Added experimental support for the new MacBook models. MacBook Pro or MacBook. Some support for iMac and Mac mini. Not a lot of change on the Apple Certified Refurbished site this week. The 1.6 GHz MacBook Air gets a $50 price drop and several models are sold out, but there's still a great selection.